Look forward to mountain views and morning swims at Mother’s Dream! This updated pet-friendly cabin for 12 is ideal for single or double family vacations, small groups of friends, or couples’ retreats. You’ll enjoy 3 bedrooms, 3 ½ bathrooms, and more than 3,000 square feet of space inside this charming Pigeon Forge cabin. Mother’s Dream is located about 8 miles from downtown, providing mountain views for miles. Some of the interior amenities included with Mother’s Dream are a game loaded loft, TVs in all the bedrooms, access to wireless internet and a washer/dryer, and your very own indoor pool! 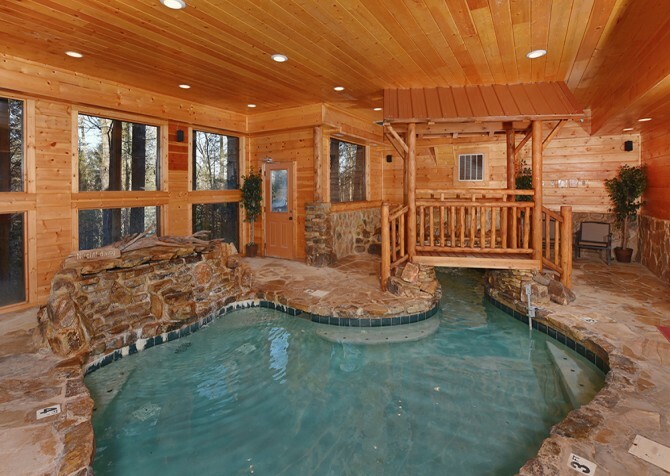 Fully enclosed with natural stone floors and large windows, the Mother’s Dream pool room will wow your guests along with this Pigeon Forge cabin’s other updated features: granite countertops in the kitchen, hardwood floors throughout, modern furnishings, and so much more. Play an arcade game, host an outdoor picnic, or take a relaxing soak in your outdoor hot tub—there are so many ways to enjoy a small group stay at Mother’s Dream! One of the first cozy spaces you’ll enjoy inside Mother’s Dream is its large and inviting living room. With high ceilings and large windows, this room offers plenty of natural light throughout the day. Sit back on the large sectional or on one of 2 gliders provided by Mother’s Dream. 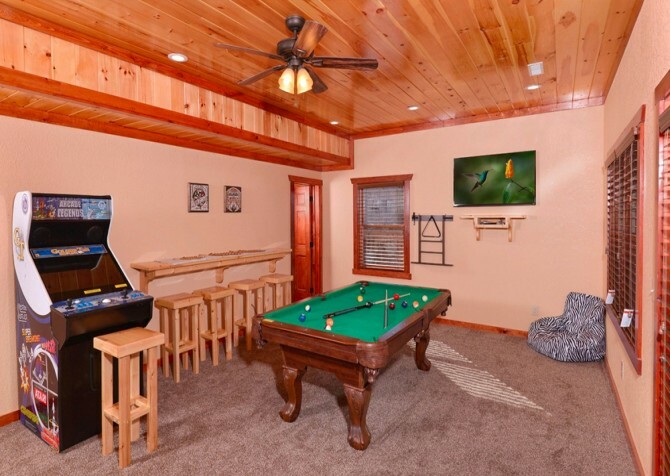 You can surf the web on your tablet using this cabin’s wireless internet access, watch a favorite TV show on the huge flatscreen mounted above the mantel, or simply gaze into the distance, enjoying impressive mountain views provided by this Pigeon Forge cabin. The gas fireplace is a cozy amenity that you’re sure to appreciate during a wintertime stay. And Mother’s Dream is a great cabin choice for visiting the Smokies in the winter because all the roads leading to this cabin are flat and paved, and the driveway is flat with 5 parking spaces for your convenience. If you’re planning a family getaway to Pigeon Forge, you’ll need everything Mother’s Dream has to offer, including its fully equipped kitchen. This large kitchen features all your major appliances in black and a separate island with your oven/electric stove, which offers even more prep space for cooking. Enjoy granite countertops, recessed lighting, and beautifully stained cabinetry that complements the interior of the cabin. Along with your major appliances, Mother’s Dream also offers a toaster and coffeemaker, plus all the cookware and utensils you’ll need for delicious homemade meals. When you’re not visiting popular Pigeon Forge restaurants, you’ll love having access to the full-size kitchen inside Mother’s Dream. Separate from the kitchen and living room is a private dining space, which is perfect for enjoying a pancake breakfast or homemade dinner with your family in the Smokies. Surrounded by windows that offer mountain views unlike any you’ll find in a downtown restaurant, the Mother’s Dream dining table has place settings for 8. Other dining options include a breakfast bar attached to the kitchen, which has room for 2, and an outdoor picnic table on the porch. Mother’s Dream also provides access to a charcoal (picnic area–style) grill and a gas grill. Plan for everything from a Fourth of July cookout to a Thanksgiving feast at Mother’s Dream! Although you’ll find plenty of indoor attractions in nearby Pigeon Forge, including Dolly Parton's Stampede, cabins like Mother’s Dream offer hours of indoor fun without ever leaving the driveway! For the perfect place to get started, head upstairs to the game-loaded loft. 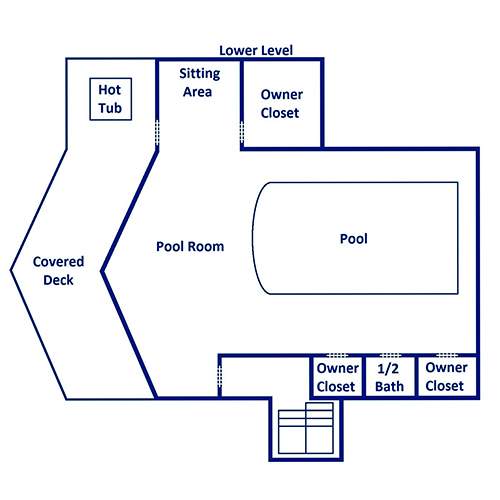 Plan for a family pool tournament in this space using the pool table. Or play on one of 2 arcade systems—one of which offers a 43-inch screen! Your kids will love the variety of video games provided by this cabin, and you’ll save yourself tons of money in the process by avoiding the cost of tokens at a downtown arcade. Another premier piece of indoor entertainment provided by Mother’s Dream is your indoor private pool! This gorgeous indoor pool is fully enclosed in a wood-framed pool room that matches the interior of the cabin. The stone floor adds to this pool’s elegant design, and the large windows mean you can enjoy mountain views even while taking your morning swim! Use this pool to keep up with your daily exercise routine or as the perfect place to play with the kids on a hot summer day. You won’t have to worry about sunscreen or chilly weather to enjoy a small group swim at Mother’s Dream! To accommodate your small group during your Pigeon Forge stay, Mother’s Dream offers a variety of sleeping options in its 3 bedrooms. 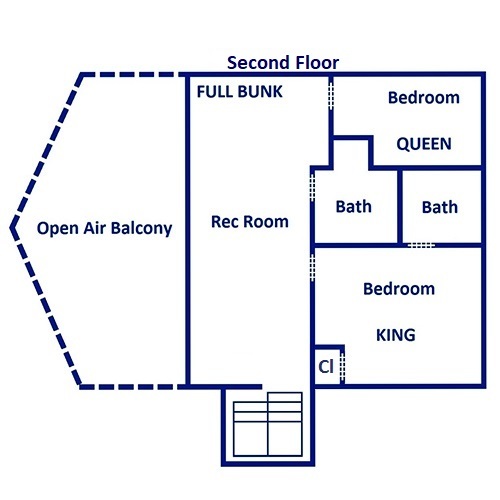 Two of the bedrooms offer king-size beds, and the third, a queen-size bed. In the loft, you’ll find a full-size bunk, and this cabin also features a queen sleeper for your convenience. Each bedroom comes with its own TV, so no one has to fight over the remote before bedtime. Each bedroom also comes fully furnished with elegant bedroom suites, readings lamps and ceiling fans, and its own bath. Total, Mother’s Dream offers 3 ½ baths to go with the 3 bedrooms and sleeping space for 12. Now this is where the dream really comes true at Mother’s Dream! The outdoor spaces are simply unforgettable thanks to this cabin’s amazing mountain views. Sit on your open-air rocking chair porch and view several chains of the Smoky Mountains for miles. Along with rocking chairs, Mother’s Dream offers reclining porch chairs and your very own outdoor hot tub. After hiking to waterfalls in the Great Smoky Mountains National Park, you’ll need these relaxing amenities to kick up your feet and soothe your sore muscles. Finally, this cabin offers a covered picnic area for your small group to enjoy. Plan for family barbecues or an outdoor celebration with the Smokies as your picture-perfect backdrop at Mother’s Dream. What makes these outdoor spaces even better? Mother’s Dream is pet friendly, so you’ll have space and fresh air for playing with your 4-legged friend instead of being cramped inside a hotel room! Forget boarding – this vacation will be fun for everyone in the family! 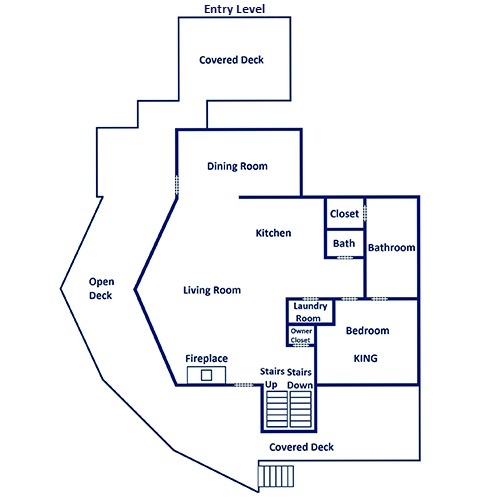 To add to your convenience at Mother’s Dream, enjoy access to a washer and dryer along with wireless internet service. Be sure to pack all your favorite devices and stay up-to-date with our Cabins for YOU blog while you’re in town! And to add to your entertainment, Mother’s Dream supplies a CD player and DVD player to all its guests. Bring your favorite movies or stop by a nearby Redbox to pick up a new release—either way, you’ll love hosting movie night at Mother’s Dream during your Smoky Mountain stay! Situated on 43 private acres, this zipline attraction will help you see the Smoky Mountains in a brand new way—from 275 feet in the air! If you’re looking for thrills but you’re not into heights, this attraction is a good choice for you. You’ll ride through the Smokies at speed of up 25 miles per hour, but this coaster stays firmly on the ground. If your kids are loving the arcade games in this cabin’s loft, don’t miss MagiQuest—an interactive, live-action, role-playing experience in Pigeon Forge! "Just spent 4 nights at this cabin (Mother's Dream) and it was awesome! Beautiful cabin with gorgeous, amazing mountain views. So clean and spacious. The pool was huge and a big hit. And the outdoor hot tub was so relaxful! Would highly recommend this cabin;…"
"Just spent 4 nights at this cabin (Mother's Dream) and it was awesome! Beautiful cabin with gorgeous, amazing mountain views. So clean and spacious. The pool was huge and a big hit. And the outdoor hot tub was so relaxful! Would highly recommend this cabin; even our dog enjoyed the stay." Thank you so much for this raving review! We are so glad to hear that you enjoyed everything from the pool to the hot tub. We hope you and your guests come to stay with us again soon!
" We love cabins for you! Used them the last two years. We stayed at this particular cabin (Mothers Dream) just a month ago for 9 days and were so happy with it. Beautiful and fully stocked with everything you would need. The pool was amazing! One of the best views for sure and very private. Loved being able to leave the shades open all day everyday and take in the view. We will definitely be visit this cabin very soon." "My experience with Cabins for You was wonderful! I decided on a last-minute vacation and they worked with me to ensure that my reservation was processed quickly. They answered all of my questions with patience and understanding, helping to ensure that I enjoyed my stay. The cabin itself ("Mother's Dream") was AMAZING, from the gorgeous views all the way down to the tiny details (a "welcome package" that included all those little items needed in a vacation rental). My son and I could not have asked for a better stay. We definitely will be coming back!"